It's Monday again. Thanks for stopping by! This is a good Monday because I'm on vacation! Yay! I'm hoping to fit some reading time into my vacation this week, but I'm not sure I'll have a chance to do much blogging. We'll see how that goes. Last week wasn't nearly as productive as the week before, but I still did some reading. I published my review of Life, In Spite of Me by Kristen Jane Anderson this morning. I'm also hosting a giveaway so be sure to click on the title to read my review and enter to win a copy! 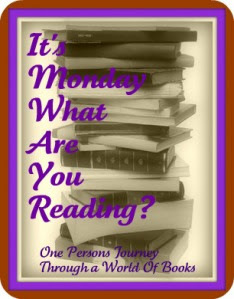 I also published my What My Children Are Reading post again this week. And I finished reading The Post-War Dream by Mitch Cullin, but I haven't had a chance to write my review yet. I'll try to get to it this week. I did like this book, but it was one of those books where I had to be in the right mood to read it and enjoy it. I'm currently reading The Last Christian by David Gregory. This is for a blog tour that's happening next week, so check back then for my review and another giveaway! HI Julie - happy vacation! I hope you are enjoying some beautiful weather and a wonderful book! 1) have a fantastic vacation!